Part of that, of course, is a direct result of the Horseracing Wrongs-sponsored protest. Local activists came out in force – and the media followed. 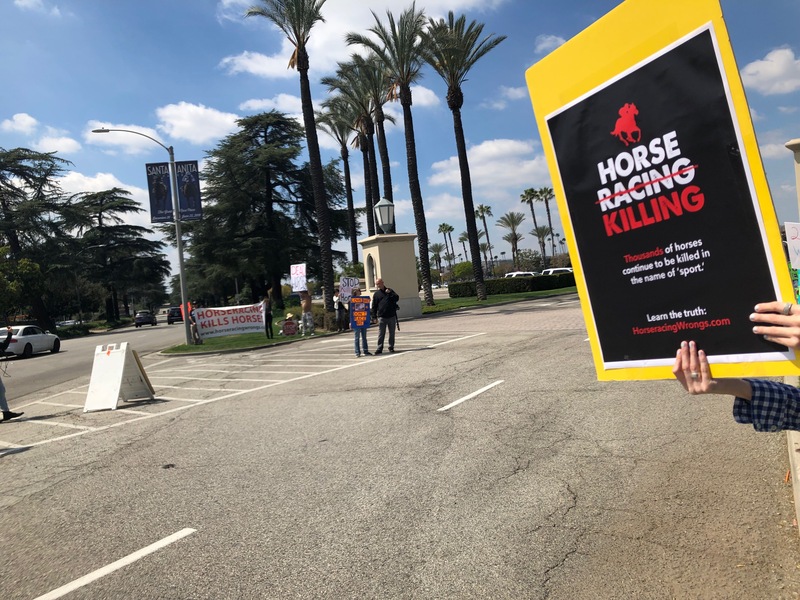 Speaking to the News, long-time HW supporter Wayne Johnson said: “I don’t think people are going to want to come to a track where horses are dying… People will look back at Santa Anita in 2019 as the tipping point.” And a special debt of gratitude to Heather Wilson for spearheading the effort. Here’s Heather in KTLA’s coverage. Moral progress is at hand; let us seize the moment. Thank you Heather, thank you protestors! – words fail me when expressing my gratitude to each and every one of you! Thank You for speaking out !! 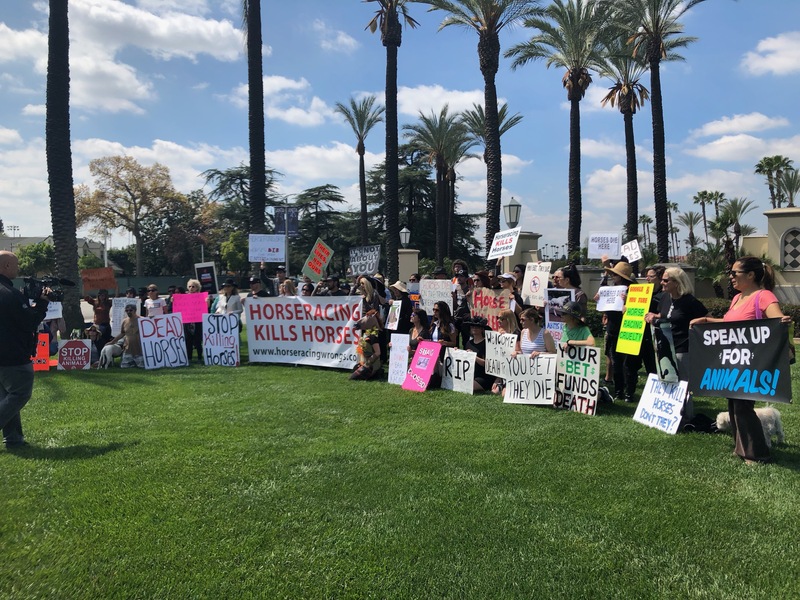 THANK YOU to the wonderful people — the Protestors — who are diligently working out there in order to inform the world of the horrors of this despicable industry — SHUT DOWN THIS BRUTAL INDUSTRY PERMANENTLY — THE ATROCITIES AGAINST HORSES are UNCONSCIONABLY, DEPRAVEDLY CRUEL. A huge shout out to Heather and all the brave, peaceful protesters exercising their right to educate. Heather, a special thanks to you. Your articulate and concise description of horse racing was right on!! My only regret is that I wasn’t there, but I know that the racehorses spirits were there. This is unprecedented progress that has never happened to this extend and, finally, the media is presenting the racehorses’s side of the story not just the apologists. Isn’t it shocking that the horse racing business dictated to a top Senator Feinstein basically telling her that they were moving forward, and that her letter didn’t count. 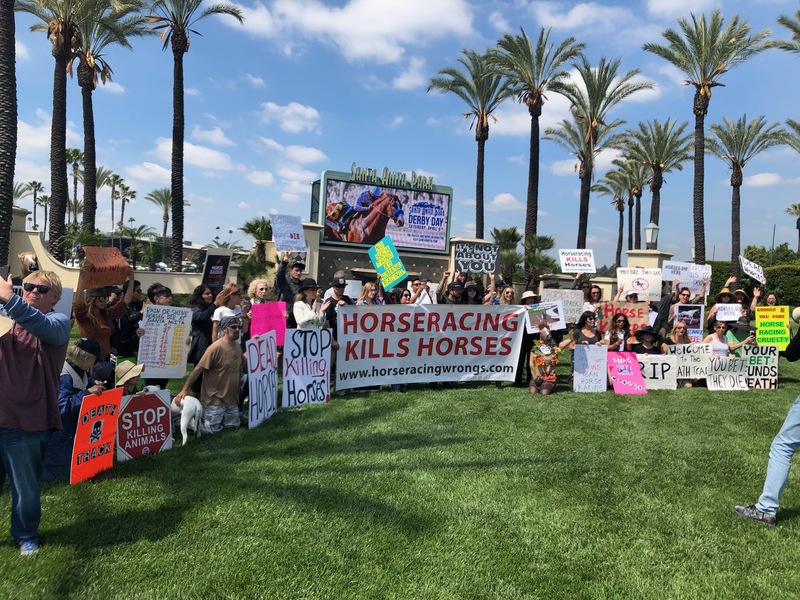 They’ve been doing this for years, and it’s time for people to tell horse racing: enough! Good! I am so glad the media and everyone else is putting pressure on the industry in order to help these beautiful horses.